Do you ever feel that if you could just get organized, you might get something accomplished? That has been me these past couple of months. You might wonder what has happened to the recipes here at Cultured Palate. There have not been any new ones posted in several weeks! Well, I have one word for you …..
Our kitchen closed for it! Yes, I was so busy with pruning that I honestly fell into a rut of the same old, same old meals. We ate our main meal at lunchtime and our lite dinners frequently consisted of cheese, crackers and yogurt smoothies. The kitchen is open once again! 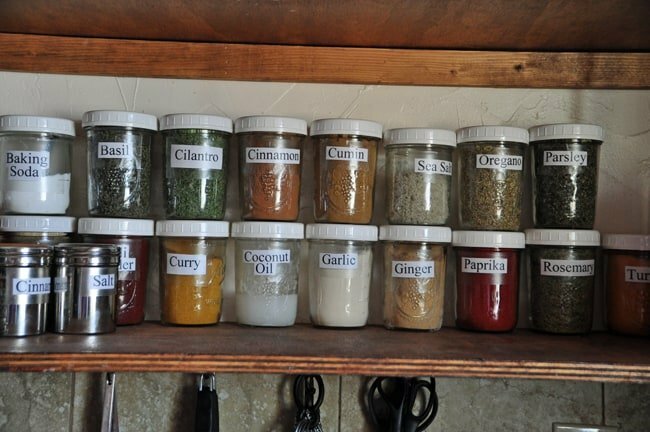 So, one of the first things I did after pruning was to set aside time for getting organized – from kitchen to pantry. Maybe you know how it is, you are in a hurry so you just put the bag of whatever on the shelf. And, you do it again and again until it is hard to find what you are sure you have! For us, living in the basement (or what soon will be) means we have 9 people living in 1500 sq ft so there is not a lot of room for clutter. And, that is what my pantry was full of – clutter. I couldn’t believe it when I found 3 partially used bottles of apple cider vinegar opened! That is ridiculous! I started cleaning, consolidating and even threw out a few things! Getting organized had been put off too long! My favorite part of all this was the fact that even though my pantry area is large, it tends to get difficult to enter because of all the 5 gallon buckets that I use to store bulk items. Buckets coupled with large cans of vegetables like green beans, tomato sauce and diced tomatoes can make it difficult to get to what I need. Now that is cleaned up and I can get to my shelves! Believe it or not, this actually saves me money because now I know what I have and can use what I have. No more buying duplicate products because I can’t find what I know I have! I like to keep staple pantry items in glass jars so I can see them easily and they are airtight – just in case we are ever infested with bugs. 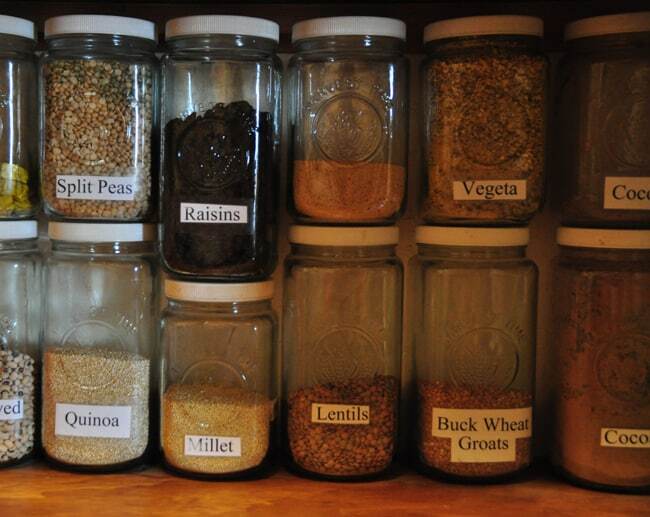 I was able to re-do and organize my jars which makes the whole pantry look more organized. I also tackled my spices. I purchased from my affiliate partners bulk herbs and spices and placed them in wide mouth pint jars(that I already had), labeled them and capped them with wide mouth plastic lids. I think it looks so cool! Not only have I saved money buying them in bulk, I also now have better quality spices! Getting organized has made me feel much more inspired and creative !